Pop Culture Lunch Box: The Lemonheads Vs. The U.S. Government! 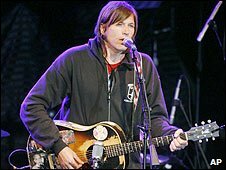 Lemonheads singer Evan Dando has taken legal action against US car maker General Motors for re-recording one of his songs and using it in an advert. The musician sued GM at Los Angeles Federal Court for violating his copyright on It's a Shame About Ray. The US manufacturer, which has been hit by the economic crisis, recently sought federal protection from bankruptcy. GM, along with music licensing company Asche and Spencer, have yet to respond to the claims. The Lemonheads scored a number of hits on both sides of the Atlantic in the 1990s, including Into Your Arms and a cover version of Mrs Robinson.